What the ...?? What are those crazy little fruits on branches? We were in the fish market the other day when I found these fabulous fresh lychee branches. It's rare to find something like this outside of Chinatown- and in a fish market no less! We walked out with a cooler of live lobsters and a bouquet of lychee's. If you haven't had or seen a lychee before, here is what they look like. A reddish rind covers the translucent-like flesh wrapped around a somewhat poisonous pit growing on branches. The flavor is reminiscent of flowers- sweet and fragrant; it's not going to be everyone's favorite. Chutney's, jams and muffins all came to mind as I pondered what to do with this strange ingredient. I also think a barbecue sauce would be fantastic. Ultimately, though, I didn't want to change the fruit itself, which narrowed the options. Friends popped by with a bottle of champagne and an idea was born. By simply blending the lychee's with a little fresh orange juice and black pepper, we had lovely, flowery mimosas to start our day. Strange ingredients are so fun to play with, don't avoid them. 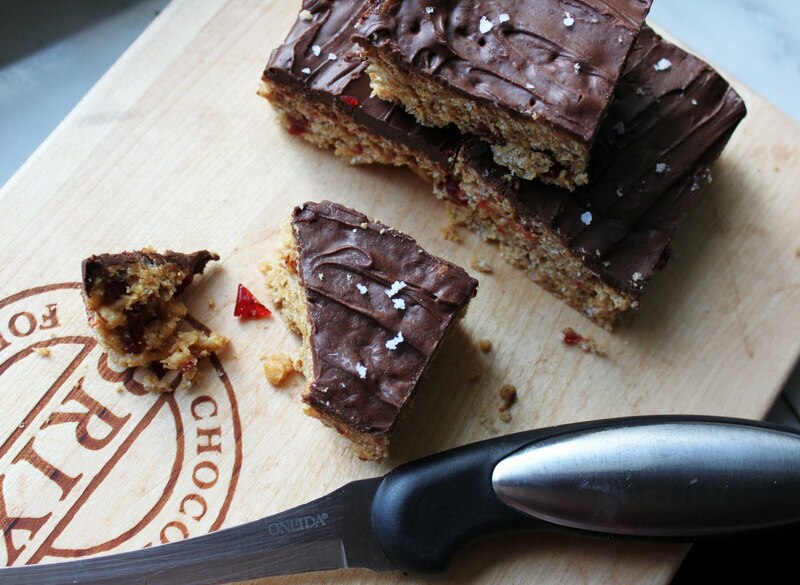 Buy them, taste them and experiment - you may just be sending me a new fat and happy recipe! Place the lychee's in the blender, squeeze the juice of the orange into the blender and add a twist or two of fresh ground black pepper. Blend until smooth. Fill 4 champagne glasses about one quarter full with the lychee puree, top with champagne (stir if needed) and add a lychee fruit half to the edge of the glass. Serve immediately. August is Puerto Rican month for Gozamos, a celebration of family, adventure and love. I struggled with what recipe to make because there are so many options and so little time. I reached out to a very good friend who is dating a Puerto Rican descendant, hoping for some new super secret recipe concoction. The response back was "we can help, but it's probably gonna involve deep frying hoofs"... After my giddy excitement wore down, I realized this is not exactly an undertaking most readers are going to want to take on. Save that for another day. Ok, so go to the opposite end of the spectrum- the most notable, staple Puerto Rican dish- Arroz con Pollo or Rice with Chicken. 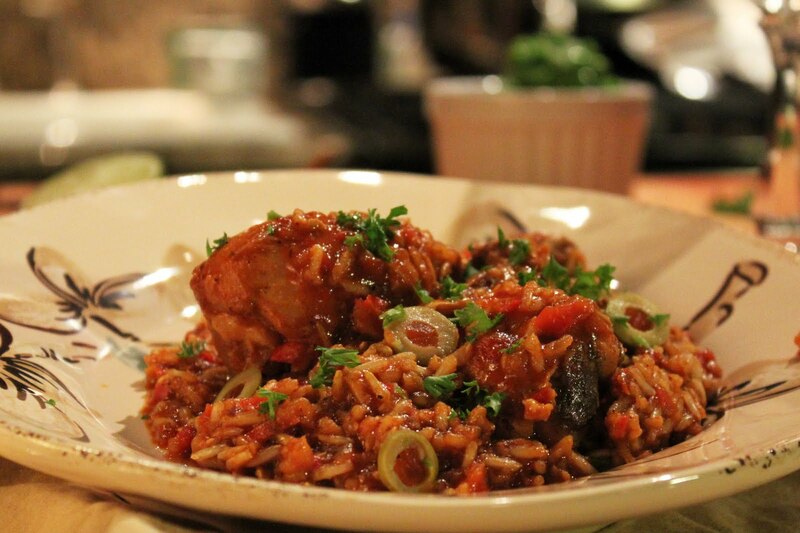 I must be completely crazy to showcase my version of Arroz con Pollo, this dish that every Puerto Rican family has their own tradition for. Some add peas and some don't, some use saffron and some don't, some have bacon or ham and some people let the bottom brown to the point of crispy rice like a paella. There is so much to say about this staple dish, like the sofrito that is the base (the garlic, onion and pepper trio) or the adobo rub on the chicken; just know variations are endless. Now, I know I'm opening myself up to a lot of potential comments and criticism, for certainly there are many versions more traditional than mine. I'm willing to take that chance. If you look at this dish for what it is, a super simple, one pot dish of chicken and rice, then maybe, just maybe a hint of praise will find its way too. 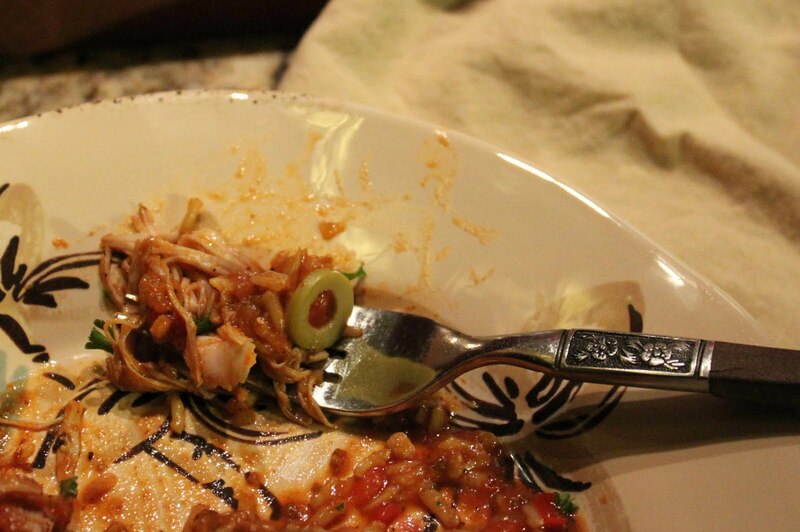 The key to this post is to celebrate the Puerto Rican love for family and food- chicken, hoofs and all. Cook up this tradition, invite your mom/grandma/family over, fight for your version of this recipe and be revel in the fat and happiness of it all. Tips and Techniques: Use bone-in (dark) chicken rather than a chicken breast to impart a deeper flavor. If you use a true long grain rice, the rice could take up to 1 hour to cook. For a soupier (sopa) version, add another cup of wine or broth. Begin by rubbing the chicken with the garlic, oregano and pepper. Brown the chicken pieces in a cast iron pot in a few tablespoons of canola or olive oil. While the chicken is cooking, soak the rice in the wine with the saffron and 1 tsp of paprika. Chop the garlic, onion and pepper if you haven't. Remove the chicken and set aside. In the same chicken pan, add the onion, pepper and garlic; saute for about 10 minutes. Add in the cumin, paprika and salt, continue to saute for another 5 minutes. Add in the tomato sauce, the chicken broth and the chicken with any juice that might have seeped out. Bring to a boil and then lower the heat to a simmer. Simmer the chicken for 10 minutes and then add in the rice and wine. Simmer until the rice is fluffy. Remove from heat. Sprinkle with the chopped olives, and peas and squeeze the lime over the top. Allow the dish to rest for 10 minutes. Serve with a sprinkling of fresh parsley or cilantro. Sometimes we need a simple treat that can be put together in minutes. These type of treats always take me back to childhood desserts like no-bake cookies, haystacks and rice krispie bars. I had a Gozamos contributors meeting and barbecue in four hours and showing up empty handed is not in my nature. With rice krispies in the the pantry and sunflower butter in the fridge, I decided to make a slightly upscaled version of the classic rice krispie bar. Just in time for Back to School baking, these would be a super treat in a lunch bag or for an after school snack. They travel well too so take them along to your next football tailgating party. Visit your youth with a simple fat and happy treat today! Tips and Techniques: Sunflower butter is similar to a peanut butter with a much earthier flavor. You can substitute peanut butter, almond butter or cashew butter for the sunflower butter. As with classic rice krispies, work quickly after adding the cereal. Bring the sugar and the corn syrup to a boil, stirring until sugar is dissolved. Add the sunflower butter and vanilla, stir until the sunflower butter is melted and combined. Remove from heat. Quickly stir in the rice krispies and the cherries. Pour into a greased pan and smooth out. Sprinkle the chocolate chips on top immediately while the bars are still warm. Let the chips sit for about 5 minutes, they will become shiny; smooth over the bars with an offset spatula or knife. Sprinkle with course salt, if desired. Allow chocolate to harden and then enjoy! Some time ago, my great friends Aaron and Alina came up with this 'strange ingredient' idea - Fat and Happy Blog readers would send me strange ingredients they come across and I will create a recipe for them. Past secret ingredients range from Himalayan pink salt and dried lavender to pistachio oil. 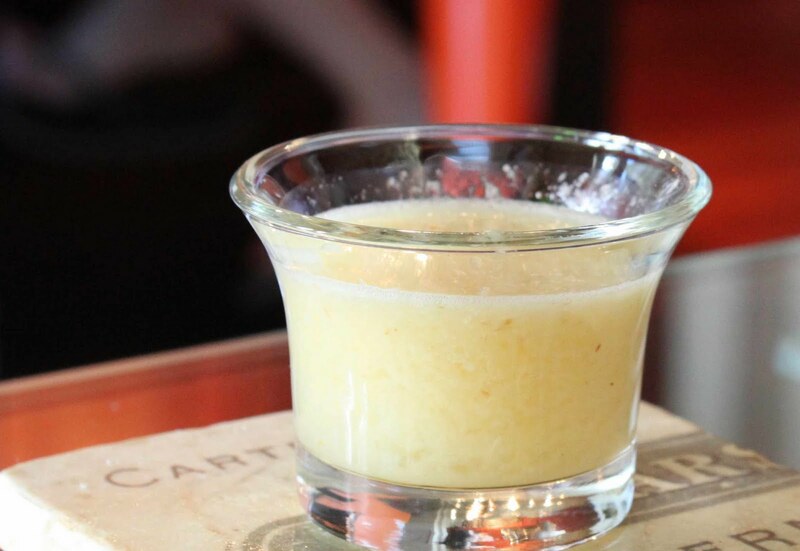 Today's strange ingredient is a spicy ginger apple mustard- sounds super yummy! With some left over prosciutto, fresh figs and a hot grill, out came the most delicious grilled fig salad ever. Ever. Simply wrapping the figs in the prosciutto, and then basting them with the mustard is all it took; setting the grilled figs on spinach or lettuce tossed with olive oil and a hint of the mustard completes the salad. Thanks much to my friends for the another strange ingredient to play with, I only wish the were here to taste the rewards. Great food is one thing, but you can't be fat and happy without great friends. Tips and Techniques: You can make this at home without the strange spicy apple mustard ingredient. Simply whisk a few tablespoon of good grainy mustard, 1/2 tsp of dried ginger and 1/4 tsp of cayenne pepper with a spoon of applesauce or apple juice. It's not exact, but close enough to recreate this extraordinary salad. Purchase a GOOD olive- it does make a difference! Cut the figs in half, wrap each half with a slice of prosciutto. Skewer the wrapped figs. Brush the skewer with the apple, curry mustard and grill. Turning once, brush the second side with the mustard. Grill until the prosciutto is crispy. Toss greens with a drizzle of olive oil, fresh black pepper and a small spoon of the mustard. Plate and top with grilled figs. Makes two large salads with 4 fig halves each or 4 smaller salads with 2 fig halves each. I'm toying with the idea of going gluten free...just toying with it. For the past few years there have been some symptoms that may suggest I have a gluten intolerance. I've been avoiding admittance on this because of the implications; this is not a small undertaking and my hats go off to anyone dealing with this disease. So I've decided to make a few dishes that are gluten free to have in my recipe box just in case. As I mentioned, this is a huge undertaking. For instance, I did not buy a true gluten free soy sauce for this recipe- but it is available. I think the key to gluten free is to find substitutes for the basic needs- like noodles, pasta and bread. 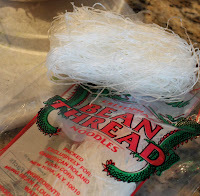 Bean thread, or cellophane noodles, are a great option. The second key is getting creative with flavor. In this recipe, the use of black tea gives a great flavor dimension. I may continue to keep eating pasta and bread until I can fully commit to an idea of gluten free; but count on seeing more GF recipes on this blog just for the fat and happy health of it. Tips and techniques: Timing is important on this recipe, so chop the leek, garlic and mushrooms before you begin. Having all the ingredients ready will help to avoid overcooking the noodles, shrimp or mushrooms. Try to find fun mushrooms rather than using a button or crimini mushrooms. I found a great mixture at Whole foods that combined alba and brown clamshell, Trumpet royale and forest namakos. Steep 2-3 bags of tea in pot with 6 cups of hot water. Pour most (about 4 cups) of the water into a large bowl and add a handful of ice cubes. Add the bean noodles to the bowl, set aside to soak for 10 minutes. Pour 3/4 cup tea into a container, set aside Add another 2 cups of water into the tea pan, leave the tea bag(s) in the pan and bring to a boil. In a fry pan, add a little olive or canola oil to the pan and the chopped leeks, saute until leeks begin to soften and caramelize. Add the garlic, toss and saute another minute. Add the mushrooms, toss and saute for 2 minutes. Add the sesame oil, soy sauce, honey, fresh black pepper and reserved tea, simmer. At this point, your noodles should be done soaking and your tea boiling. Add the noodles to the boiling tea for 30 seconds, remove using a tongs or small strainer and add to the leeks. Turn off the tea and now add your shrimp to the hot tea pan. Cook for about 2 - 3 minutes, or until the shrimp turn pink. Remove the shrimp from the tea and add to the leek pan. Toss and plate. Serve with a drizzle of Sriracha sauce, a sprinkling of red pepper flakes and chopped chives. *note, I also label this as vegetarian because you could easily modify this recipe to leave off the shrimp and still have a wonderful vegetarian dish. I was walking through Whole Foods the other day on a mission to pick up fresh shrimp for my soba noodle dish creation. Little green baskets filled with fresh figs caught the corner of my eye; I stopped dead in my tracks causing the man walking behind me to smack right into me "Sorry" I said apologetically as I nodded to the figs, "but I spied a basket of fresh figs over there." He was very nice about it and asked me to grab him a basket too! Arriving at home it was hard to pay attention to the dish at hand, the figs were calling my name. So many options and only two of us to test it out on. Being that it's summer, I just can't shy away from the grill. A little brown sugar rub for the grill and a dollop of mascarpone cheese placed on top just as they come off the grill so that it melts slightly and becomes creamy.... ah, heaven. I think the key to this story is that we must always be on the look out; stop rushing so much that you can't look around. 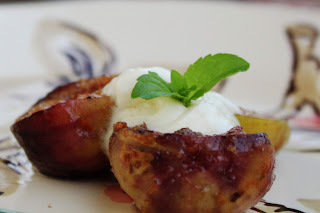 I nearly missed those figs and you all would've never seen this grilled figs with sweet mascarpone recipe nor would you see the soon to come grilled prosciutto wrapped figs recipe (equally outstanding). An open mind and open eyes make one fat and happy eater! Tips and Techniques: Face all the cut figs in the same direction on the skewer for easier handling. Mix the oil and brown sugar in a bowl. Cut the figs in half, place in the brown sugar bowl, toss to coat well. Spear the figs on barbecue skewer, place on an oiled grill over medium high heat, turning at least once. Gill until the figs are caramelized and have nice grill marks to them; this should only take a about 4 minutes per side. In the meantime, mix the mascarpone cheese and the powder sugar until well combined. 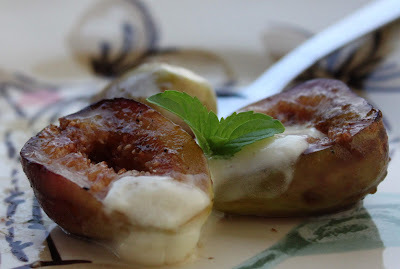 Plate the figs, add a dollop of the cream and top with a few mint leaves. Serve immediately. Delicate pasta with layers of hot cheesy tomato-y goodness, lasagna just can't be beat ... in the winter. Let's admit a heavy and hot dish, albeit superbly tasty, just doesn't work in the summer. But with the wave of a magic wand, a few fresh herbs and bright veggies, a summer lasagna is born. This is a fun option for a summer picnic or barbecue. And you won't have to heat up your kitchen. It's an elegant fat and happy summer meal. Tips and techniques: If you don't have a grill, you can also oven roast the zucchini. 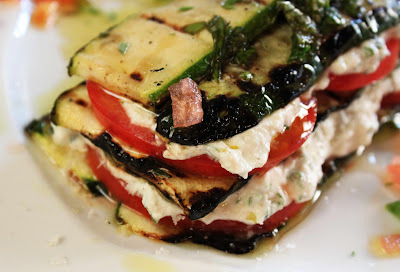 Or go completely fresh and use the zucchini raw. The freshest, home grown ingredients will yield the best flavor. This serves 2 along with a side salad. Slice the zucchini lengthwise and then slice the tomato. Be careful to slice these the same thickness; using a mandolin works the best. Try to slice about 8 slices out of the zucchini, that should put your thickness about 1/8 " thickness. Mix the olive oil, half of the fresh basil and thyme together; then marinate the zucchini and tomato slices in the oil for about 20 minutes. Mix the ricotta, Parmesan, garlic powder and remaining fresh herbs. Add salt and pepper to taste. Next, grill zucchini slices (reserve the oil) and cool slightly. Now assemble the lasagna. 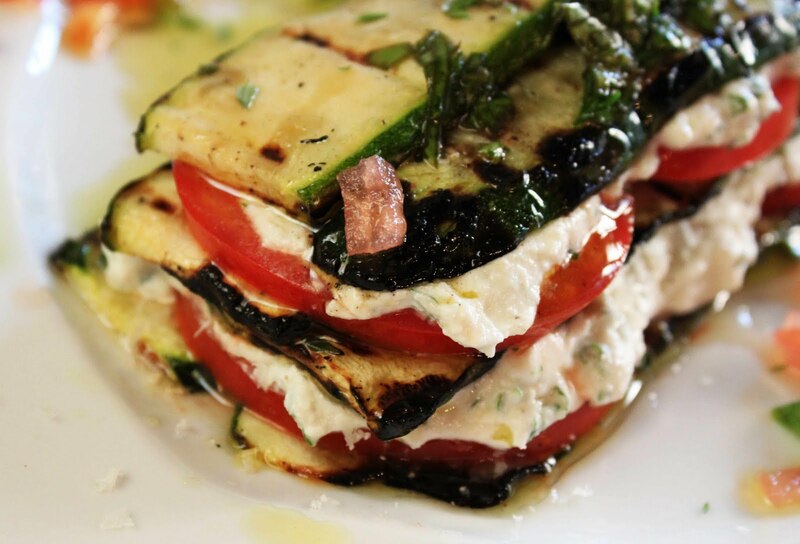 Begin with two slices of zucchini, top with 2-3 slices of tomatoes, and a layer of ricotta cheese. Grate a bit a fresh Parmesan and pepper on top of the cheese. Repeat. Top the final layer of cheese with two zucchini slices. Drizzle the dish with a few tablespoons of the marinade oil and a few sprinkles of fresh basil and parsley. Enjoy! Today Dave declared he was making eggs with salsa. 'Sounds great, but we don't have any salsa' I smugly quipped. 'There's a tomato in there, you can make some' Dave replied. He was quite serious too. This from a guy who doesn't want to be an inconvenience; it was a rare statement. I could do nothing but rise to the request. He was right, we indeed did have a tomato, along with one jalapeno pepper, a lime and some parsley. These ingredients were screaming for a salsa. After removing those ingredients from the fridge, a stray red bell pepper stood silent; it looked so lonely I just couldn't leave it in the cold dark fridge alone, so in the salsa it goes. Quite honestly, there is nothing super secret or different about this salsa recipe, it uses all the typical base salsa ingredients and it goes together in about 10 minutes. It's a combination of a fresh salsa and a roasted salsa without the long wait of the full roasting. My red pepper salsa was ready at the same time the eggs were, we ate and went about our day. Simple. Another fat and happy request complete. Tips and Techniques: If you do have time and want to further roast the tomatoes and the red pepper, drop them on a cookie sheet and into the oven until the skins burst. They become sweeter with roasting. If you want a milder salsa, do not use the full jalapeno after roasting it. Start with half and then add more according to your taste. Pan roast the jalapeno and garlic. Do this by simply placing them in a dry fry pan on medium high heat to sear the skin. Toss often and be careful not to burn the garlic. Remove garlic clove, cut the tomatoes into 4 quarters and add to the pan (skin side down). The goal is to just add a hint more flavor by a quick roasting. Don't toss them, just let them sit in one spot, that spot will become dark- remove from heat just before that spot on the tomatoes turn black. Should take just a few minutes. Finely chop the onions and red pepper. Place jalapeno and garlic in Cuisinart, blend until finely chopped. Add tomatoes and salt, pulse until all combined and tomatoes are chopped up. Pour into a bowl. Add chopped onions to bowl. Add half of the red peppers to bowl and the other half to the Cuisinart. Add the parsley and juice of one lime to Cuisinart - blend until finely chopped. Add to bowl. Mix and serve.